The al-Amara souk in Damascus is packed with people and goods. Traders are selling everything from sticky Arab sweets, spices and jewellery, to more mundane kitchen utensils and make-up. But if the Syrian government approves a new road construction project, it may disappear. 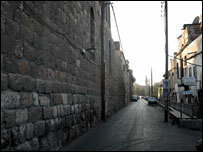 There are plans to widen a road just outside the northern wall of the capital's old city. The area within the city walls is a UN-designated World Heritage site. Outside the old city, there is no such protection. Two souks, more than a thousand shops and hundreds of homes lie in the path of the proposed road. Many of the buildings due for demolition are several hundred years old. The people who live and work there are anxious about the future. Bassam Kattar, 40, grew up in the area and now works as an exporter. "The mayoralty wants to take our shops, our buildings, our businesses, so it can widen the street," he says. "Everyone here is angry - these shops belonged to our fathers and grandfathers. They want to pull us out of our homes and send us to a village." Another trader, Salah, leads me to a house down a street so narrow it is barely touched by sunlight. The house is attached to a small mausoleum. Inside, the tomb is covered in green sheets - the colour of Islam. "There are four sheikhs (religious leaders) from my family buried here," he tells me. "It's haram (forbidden) to demolish this place." The proposed highway has mobilised the local community. People are waging a big campaign to persuade local politicians and international organisations to oppose the project. Waed al-Muhunna, a local organiser from the Heart of Damascus, a group that aims to protect Syrian cultural heritage, says that many of the buildings outside the city walls are as old as those inside. "We need to treat this area with care - we cannot bulldoze it," he says. The United Nations Educational, Scientific and Cultural Organisation (Unesco) has also become involved. The director of the Unesco World Heritage Centre, Francesco Bandarin, says the site outside the old city should act as a buffer zone. "We believe that a rehabilitation of the area is possible while maintaining its historical character and urban fabric," he says. The Syrian government set up a commission of experts to look into the issue, after the proposal was first raised earlier this year. The authorities say the project will ease traffic flow and preserve the city's walls from what they say is illegal construction. The Syrian culture minister, Riyad Nassan Agha, insists his department is committed to the protection of the area. But, he says the current single-lane road does need to be widened. "This would not affect the importance of the area," he says. "On the contrary, tourists could stop their buses there - it would facilitate tourism." A final decision on the highway will be taken later in September. 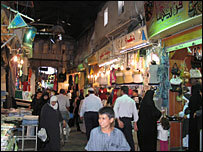 Back in the souk, many traders and inhabitants remember similar projects in the 1980s, when hundreds of buildings were demolished around the old city. This time, they are hoping culture will win out over the needs of cars.